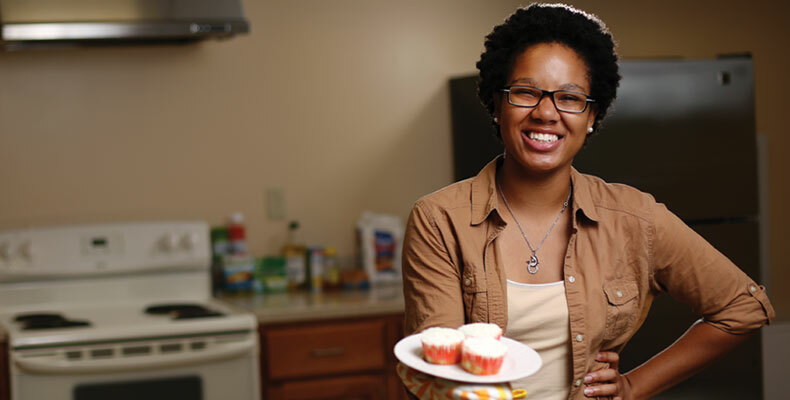 Food Network aficionado Darian Johnson always wanted to be a chef. In high school she also discovered an affinity for chemistry. Of course, Missouri S&T was not one of them. A Missouri S&T representative who visited Johnson’s school during a college fair also encouraged her to give Rolla a try. “He said, ‘I’ve seen your test scores. You should really think about engineering,’” says Johnson. He suggested she study chemical engineering, supplemented with some online food science courses. Johnson visited campus for a Pre-College Initiative program. “After meeting students and seeing campus I thought, ‘I might actually like this place,’” she says. But when Johnson arrived as a freshman, she didn’t participate in anything outside of class. She also ignored numerous emails inviting her to meet potential mentors, she says. “I just kept hitting delete, delete, delete. So my freshman year I didn’t have a mentor,” she says. Today, she mentors others through the student diversity program, during Opening Week, and as a student success coach at the Burns & McDonnell Student Success Center. Johnson is also the new president of the Association for Black Students and is active in Phi Sigma Phi national honor fraternity.